German and Russian professor Rob McFarland explores the advent of fake news and the effect that it can have on the lives on everyday people. Sensationalism and exaggeration have always had a home in the news industry. However, that home has grown more crowded as speculation and fake news have begun to nestle their way into the reporting of many journalists. News is meant to be objective, but in the fast-paced world of deadlines, it can be tempting to compromise integrity in exchange for readers or page views. BYU International Cinema’s latest offering, The Lost Honour of Katharina Blum, demonstrates the dangers of this trend and to introduce the film’s first showing, Professor Rob McFarland described how the lingering effects of fake news can tarnish the lives and reputations of innocent people. Although The Lost Honour is set in Germany during the 1970s, McFarland noted just “how useful this film is for us right now.” The 1970s played host to a wave of German democratic reforms, and The Lost Honour capitalizes on the fervor of the time. With protests not unlike those happening today, Germans grew frustrated with those in power—many of whom were ex-Nazis—and found their protests met with violence. Sadly, this violence was met with further conflict as McFarland described the growth of organizations like the Rote Armee Fraktion (RAF) who abided by a policy of fighting fascism with the similar violent tactics. As tensions rose, the RAF underwent a series of bombing campaigns that senselessly took lives on both sides. 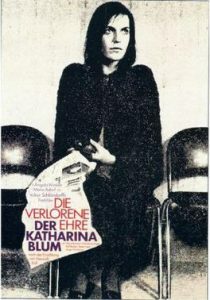 It is in this world that Katharina Blum finds herself. After falling in love with a man she has just met, she is quickly beset upon and tormented by the media after it is discovered the man she loves is a terrorist and bank robber. As the media descends upon every facet of her life, Blum is left helpless as reporters sensationalize and publicize a scandal of their own making. McFarland noted how this situation, and many of those encountered by the modern media, walks the razor’s edge of free speech as the publication of falsehoods or even exaggeration has the capacity to ruin a person’s life despite still being passable as free speech in some instances. As yet another barrier, Katharina is forced to confront the media preying on her womanhood. McFarland detailed The Lost Honour’s exploration of gender and power revealing societal expectations towards female virtue and the way in which this virtue denotes inherent worth. Given her relationship with a wanted criminal, Katharina’s virtue becomes the media’s target, and she is forced to endure both libel and slander that a man in the same situation would likely escape. Katharina’s struggles echo the effects of what McFarland and scholars everywhere have termed the post-truth era. In this current era, we are experiencing what McFarland described as a “reliance on assertions that ‘feel true’ but have no basis in fact.” He described how social media has created echo chambers that deepen and further perpetuate biases as we have allowed our “feelings, not facts, to reinforce prejudices.” Living in such a world—where we daily experience the bombardment of internet news, social media echo chambers, and biased reporting—forces us to daily confront the extent of truth around us and reconcile that the claims we encounter may not always be truthful. Eric Baker covers events for BYU’s International Cinema. He is a senior pursuing a degree in news media with a minor in political science.